Courtesy of Lynn DeBruin Pat "Deep Dish" Bertoletti pocketed $1,500 for eating nearly 4 pounds of "oysters." BLACKHAWK, Colo. -- Pat "Deep Dish" Bertoletti has a culinary degree and a dream of one day opening his own gourmet restaurant. 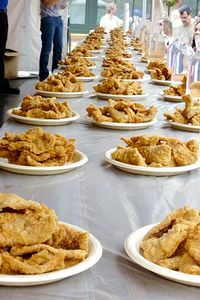 So why did the Chicago man recently chew down nearly 4 pounds of deep-fried bull testicles -- also known as "Rocky Mountain oysters" -- in 10 minutes? Maybe just because he can. Bertoletti, 25, is a champion eater, ranked No. 3 in the world, with records for everything from regular oysters (34 dozen in eight minutes), to pickled jalapenos (275 in 10 minutes) and Mars Bars (38 in 5 minutes). Still, the guy who loves food and recently tried emu in Australia admitted he had trouble with the sliced but deep-fried "oysters" Saturday. 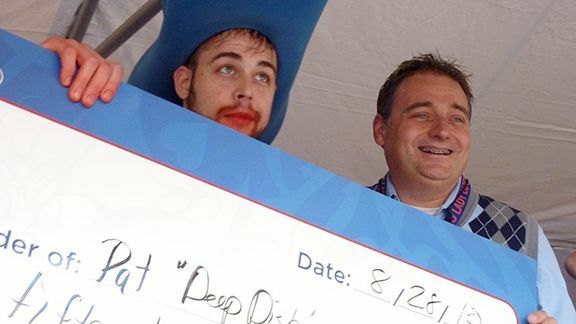 "This is one of the hardest contests I've ever had," said Bertoletti, who pocketed the first-place check of $1,500. "All of a sudden they were ice cold and it was like chewing rubber." He came away looking more like a clown under a 10-gallon, blue-foam hat with a cherry-red mouth from slugging down cupfuls of Crystal Light to help 3 pounds, 11.75 ounces of the crunchy meat slide down his throat. Lynn DeBruin Doesn't this look quite yummy? How about eating nearly 4 pounds of it? Bertoletti "practiced" for the event by eating tons of "Swedish Fish" -- those red, gummy, chewy candies. He'd beat Tim "Eater X" Janus ($1,250) of New York by a mere half-ounce in the event held at a Colorado casino. Notorious "B.O.B." Shoudt ($1,000) was third having choked down 3 pounds, 10 ounces, while 100-pound hair salon owner Juliet Lee ($750) was fourth. While some may find the contests disgusting, championship eating can be lucrative. Janus said a few of the top-ranked eaters, including No. 1-ranked Joey Chestnut -- he downed 54 hot dogs and buns in 10 minutes to win the famous Nathan's contest for the fourth straight year this summer -- make six figures. Bertoletti has earned in excess of $40,000 each of the past three years, supplementing a catering business until he can afford to open his dream "Greasy Spork." Unlike some wannabe challengers, Bertoletti isn't fat; he carries about 195 pounds on his 6-foot-2 frame. He said all the weight eaters put on after a contest typically comes off within a few days. Some things admittedly take longer -- like the 22 pounds of grits and salmon chowder Janus downed in one contest. But Janus, who turned to competitive eating because he was bored as a day trader on the New York Stock Exchange, bounced back from that, too. "I've always been a big eater growing up," said Janus, who wears a painted mask and keeps the mess to a minimum by washing down his food with lemonade. "I have an appetite and tolerance for discomfort in life." Lynn DeBruin is a freelance writer for Sports Media Exchange, a national freelance writing network.